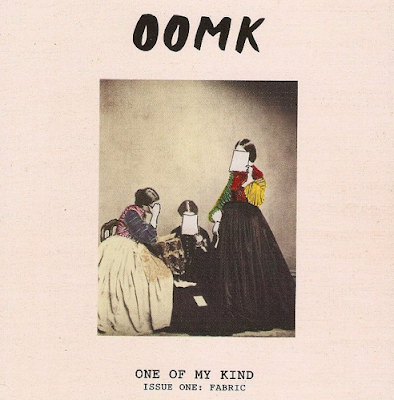 The Le Sigh: Zine: OOMK #1 "Fabric"
One of My Kind's first issue – a true intersection of DIY and activism. 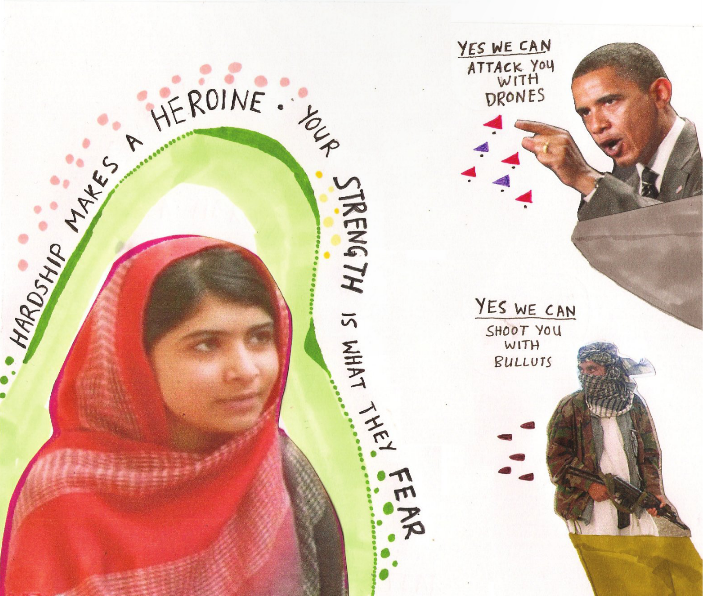 Art with a message is everywhere these days – whether it’s in the archives of your favorite Tumblr or featured on your closest friend’s timeline, the collaboration between activism and creativity within internet culture is plentiful. And so when I first leafed through One of My Kind (OOMK) zine, I saw a lot of classic images of activist art – femme fatales, humorous comics with actual thought provoking context behind it, etc. But then I saw them. 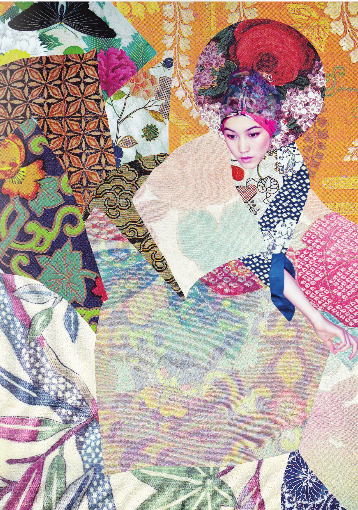 Hijabs on almost every female figure depicted in the zine’s artwork. My jaw dropped. It was perfect – and also – the zine expresses that it is “not just interested in projecting Muslim viewpoints or Muslim artists” but also in expressing the thoughts, art, and perspectives of a greater creative community interested in issues such as feminism, racism, community, and religion. As an Indian American constantly surprised or just plainly rendered numb to the lack of diversity in most of pop culture (including zine culture), I was so pleasantly stunned by One of My Kind (OOMK) Zine. As a publication invested in “learning and collaborating with lots of different people” on matters of creativity and activism, OOMK is visionary in both its mission and execution. The collective, founded by Sabba Khan, Sofia Niazi and Rose Nordin, amounts its first issue "Fabric" at a hefty 67 pages, showcasing artwork that is visually and mentally compelling. The zine opens with a page outlining the purpose of the theme fabric dropping a certain poignant phrase: “how women today incorporate fabric into their art and into their lives.” Essays like “Craftism” and “Modest Ambition” serve as mission statements for their topics of interest: women empowerment through the artform of sewing and fabric interest and the meaning of art through the activist lens. My favorite line of the zine comes from Sabba Khan’s “The Lost Art of Sewing” in which she questions our association of sewing and antiquity: “And I realize that all those beautiful foot pedals will probably go unused...as I will most likely be in H+M shopping for the latest trends next weekend.” The kind of activism OOMK promotes is organic and unapologetic, nothing restrictive or binding about it. While some may criticize certain human rights movements to be militant (I for one usually don’t see a problem with rights issues activists to be militant), OOMK is refreshingly honest with what it believes in. Wanting to support sewing and handicrafts does not mean supporting it 24/7 is realistic for the average consumer! And sometimes activist journals alienate readers by making it seem as though activism is an elitist trade. Having myself never been so exposed to the sewing and craftwork community, OOMK gives an insider’s peek into something both inclusive and inspiring. I felt like I belonged, even though I didn’t really know what I belonged to (and even though I can’t really sew.) The zine never once detracts lofty concepts like international extradition or diversity within feminism into kitschy trends; the publication succeeds in making such issues approachable without ever dumbing them down. And amid the comics of talking animals unknowingly questioning the necessity of technology and the countless messages sewn on fabric practically popping off the page, OOMK really has something to say. And you should definitely listen because sooner than later, you’ll feel like you have something to say, too. Learn more about One of My Kind here.